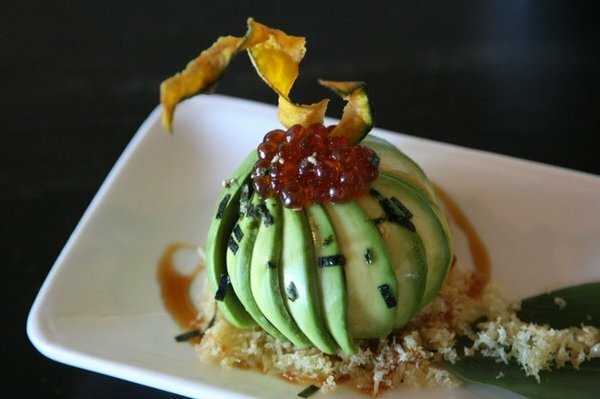 Yen Sushi is like an old friend. Not a good friend. Just someone you smile at a lot. But don’t really know what else to say to. Everyone is so damn friendly here, it’s like Sushi Disneyland. Thankfully, their sushi is so delish that you get over it and just mentally flip everyone the bird while shoving delicious fish down your gullet. It was raining like mad today and while I waited for my friends, I patiently sat in the waiting room? and ate the free candy like a madman. I came back to work with my pockets filled with dozens of plastic wrappers falling out. My colleagues must have thought I was fresh from a trip to our local dumpster. 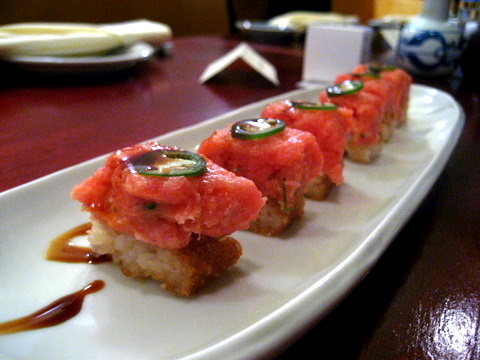 The thing to at Yen is the spicy tuna on crispy rice. See below. It’s quite decadent. You only get 4 pieces per order and that’s plenty. The sauce drizzled over it is sweet and from an unknown origin. Don’t ask my what is pictured at the top. I didn’t even eat any of it. I’m just recently getting into avocado and I’m definitely not stepping foot near a single of those abnormally large sea creature eggs. Which are actually, probably eyeballs. I’ve eaten here a million* times and usually sit at the bar, where they give you this really good dessert afterwards. They slice up this apple and plop it on a big ole pile of peanut butter!! After school snack! I’m glad you decided to specify that it wasn’t a million times. I was wondering if you might be exaggerating a bit, but a thousand times is actually believable… in your case.